The twentieth century has seen people displaced on an unprecedented scale and has brought concerns about refugees into sharp focus. There are forty million refugees in the world—1 in 130 inhabitants of this planet. In this first interdisciplinary study of the issue, fifteen scholars from diverse fields focus on the worldwide disruption of "trust" as a sentiment, a concept, and an experience. 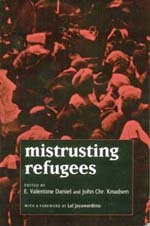 Contributors provide a rich array of essays that maintain a delicate balance between providing specific details of the refugee experience and exploring corresponding theories of trust and mistrust. Their subjects range widely across the globe, and include Palestinians, Cambodians, Tamils, and Mayan Indians of Guatemala. By examining what individuals experience when removed from their own culture, these essays reflect on individual identity and culture as a whole. E. Valentine Daniel is author of Fluid Signs (California, 1984), coeditor of Culture/Contexture (California, 1995), and Professor of Anthropology at the University of Michigan. John Chr. Knudsen is Professor of Anthropology at the University of Bergen.